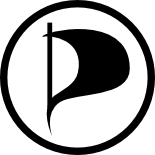 Following in the footsteps of the Swedes and Germans, the Dutch Pirate Party has decided to join the national elections being held this spring. The Pirate Party booked a surprising victory by scooping two seats in the European Parliament last year, but has yet to score its first elected seat in a national Parliament. 2009 was a breakthrough year for the Pirate Party movement. With more than 7 percent of the vote, the Swedish Pirate Party secured two seats in the European Parliament. A few weeks later, the Pirates in Germany entered the local Parliament after a member of another party switched sides. In 2010 the Pirate Parties hope to continue this hot streak, especially during the Swedish national elections later this year. However, Sweden is not the only country where a Pirate Party will end up at the ballot. In the UK the local Pirate Party hopes to compete as well and the Dutch party has now decided to do the same. In recent months there has been a lot of political debate regarding Dutch copyright law which currently allows people to download copyrighted movies and music for personal use. Several established parties have shown interest in criminalizing file-sharers, something the Pirate Party hopes to avoid. Instead, the Pirates would like to shorten the copyright term to 5 years and legalize sharing of all copyrighted material on the Internet. Tim Kuik, head honcho at the local anti-piracy outfit BREIN, is not afraid of politically organized pirates and described the Party’s plans as short sighted and unrealistic. Samir Allioui, Chairman of the Pirate Party, told TorrentFreak that he’s very happy with Kuik’s negative comments. “He gives people a good reason to vote for us,” he said, referring to the negative view that most people have of BREIN. If elected, the party will do everything it can to stop abuses of copyright, promote Net Neutrality and push for patent reform. The party is further committed to increasing transparency, strengthening fundamental rights and protecting privacy. Despite the enthusiasm of the party’s members, there is still a long way to go before they can actually compete in the election on June 9th. One of the biggest hurdles is the requirement to deposit a sum of 12,000 euros, a barrier which is meant to prevent too many parties from entering the election. Samir is confident that they will be able to raise the money in the weeks to come. He encourages all sympathizers to become a member of the Party and help to get the Pirate Party on the ballot.